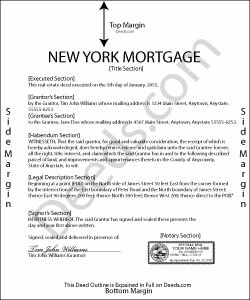 The long form is typically used by institutional lenders for a single family home. In addition to any other documents required for recording, a completed promissory note must accompany the long form mortgage. A promissory note is a negotiable instrument that contains an unconditional written promise, signed by the borrower, to repay the lender or its designated agent. The promissory note also defines the amount and specific terms of the loan between borrower (maker) and lender (payee/holder). The promissory note is not recorded on its own. Instead, it is presented for recording along with its related deed of trust or mortgage.